Married (Yinet)…have four children, Albert (8), Joaquin Jr. (6), Arianny (4) and Ezequiel (13 months). Batted a career-low .254 (49-for-193), with just nine extra base hits (seven doubles) and 15 RBI in 107 games...Started 40 of 162 games (12 at 3rd base, 10 at shortstop, 10 at 2nd and eight at 1st) and hit .287 (37-for-129) as a starter...Led the Giants in pinch-hit at-bats (34), however hit just .206 (7-for-34) in a pinch-hitting role, the lowest average on the team...His 29 games as a defensive sub were tied with STL's Peter Bourjos for the third-most in the NL...Hit .305 against LH pitchers, with eight of his nine extra base hits coming against southpaws...hit just .193 (17-for- 88) against RHs...Batted .431 (22-for-51) against LH pitchers after the AS break, the second-highest mark in the bigs behind CWS's Jose Abreu (.473)...Beginning Aug. 8, raised his batting average by 67 points from .187 to .254 by hitting .407 (24-for-59) over his final 29 games. Finished his first full season in the Majors, batting .271 (61-for-225) in 102 games for the Giants. Made 47 starts (18 at third base, 17 at shortstop, eight at second base and four at first base). Hit .368 (43-for-117) on the road, compared to a .167 mark (18-for-108) at home. Hit safely in a career-high 11 games from June 9-20, batting .364 (16-for-44) during the stretch. Was placed on the 15-day DL on July 8 due to appendicitis... had emergency surgery conducted late at night on July 7. Recorded a career-high four hits on Aug. 13 at Washington, going 4-for-5 with a pair of runs scored and a double. Injured his hamstring on Sept. 20 and missed the final eight games of the season. Spent nearly the entire 2012 campaign with SanFrancisco, batting .270 (86-for-319) with five HRsand 34 RBI in 112 games, the most games he's everplayed in a season at the Major League level. Started 79 games (39 at 3rd base, 38 at shortstop and two at 2nd base). Had his contract purchased from triple-A Fresno on April 25. Hit .316 (24-for-76) vs. LHPs following the All-Star breakand hit .303 (46-for-152) overall. Led all ML players with a .417 batting avg. (25-for-60) inthe month of August (min. 50 PA s). Spent entire season with Triple-A Omaha in Royals' organization...batted .232 (56-for-241) with 25 RBI in 69 games...Missed 1st month of season (April 7-May 9), suffering from right hamstring strain...Had successful campaign in Dominican winter League as he led DWL with .387 avg. (58-for-150), 58 hits and 4 3Bs. Made his first Opening Day roster as the Texas Rangers' utility man...Spent nearly the entire season with Texas with the exception of 8 rehab games in Frisco (AA) before being traded to the New York Mets in exchange for outfielder Jeff Francoeur and cash on August 31...Had two stints on the 15-day D.L. with a lower back strain. Arias appeared in 3 games over 2 stints with the Rangers...was recalled on May 9 but returned to Oklahoma City on May 12 without appearing in a game...joined team for 2nd time on July 29 and saw action in 3 games, defensively at third base on July 29 vs. Detroit and consecutive starts at second base on August 3-4 at Oakland...was hitless in 8 at bats and handled 8 total chanceswithout an error...was optioned to Oklahoma City on Aug. 5. After limited playing time in 2007, Arias spent most of the year with Oklahoma (AAA) before earning a late season call-up to the big leagues...was recalled on Aug. 18 when Ian Kinsler went on the disabled list and saw his first major league action since 2006...batted .291 (32-110) with 7 doubles, 3 triples and 9 RBI in 32 games for the Rangers...his 3 triples led all Rangers while Ariaswas with the club...hit .309 (17-55) on the road and .273 (15-55) at home...batted .417 (10-24) vs. lefties, .256 (22-86) against righthanders...hit .296 (8-27) with RISP...hit safely in 6 of his first 7 contests with the Rangers at .407 (11-27), including 4 multi-hitefforts...scored a run in 5 straight, Aug. 20-26...compiled career-high 6-game hit streak Sept. 11-19...posted career-high 3 hits on 2occasions, Aug. 25 at Kansas City and Sept. 27 at LA of Anaheim...hit safely in 19 of 26 starts overall with 10 multi-hit efforts...made20 starts from the lead-off spot in the order...all 26 starts came at second base, posting a .983 (2 E/117 TC) fielding pct. there whileturning 19 double plays...went 1-for-9 (.111) in 5 spring training games for Texas. Appeared in just 5 games due to a pair of injuries, playing 2 games in the Arizona League and 3 games with Triple-A Oklahoma...had played at least 120 games for 4 consecutive seasons from 2003-06...was placed on the 15-day disabled list on March 23 for a right thumb injury, sustained after suffering a cut to the thumb away from the ballpark in Spring Training...would spendthe entire year on the Major League DL, also due to the right shoulder injury...was transferred to the 60-day DL on May 17...hadrehab assignments in Arizona League (June 22-23) and with Oklahoma (June 25-29), but played last game on June 29 at Iowa as aDH...all games in the field came as shortstop...had arthroscopic surgery on his right shoulder on July 2 and did not play in a gamethe rest of the year...rated as the club's 26th-best prospect by Baseball America following the season. Arias was 6-for-11 as a September callup...batted .268 (132-493) with 14 doubles, 10 triples, 4 home runs, 56 runs scored and 49 RBIs over 124 games with the Triple-A Oklahoma RedHawks...stole 26 bases out of 36 attempts and ranked 11th in the Pacific Coast League in stolen bases...was named to the PCL All-Star team, but did not play in the game...selected to play in the 2006 XM Satellite Radio All-Star Futures Game on July 9 at PNC Park in Pittsburgh as part of All-Star Sunday, but did not play in the game because of an injury...made three starts for the Rangers, two at shortstop and one at third base. Made his Double-A debut in 2005, spending the entire season at Frisco...ranked 2nd among all full-season Texas minor leaguers with a .315 (157-499) batting average...led the organization with 157 hits...also ranked among organizational leaders in triples (T2nd, 8) and stolen bases (T8th, 20)...ranked as the Rangers' 4th-best prospect by Baseball America during the off-season...tabbed by thesame publication as the 12th-best prospect in the Texas League. Summary: Ranked among Texas League leaders in hits (4th, 157) and batting average (5th, .315)...had the 4th-lowest ratio of strikeoutsper plate appearance in the TL, one every 11.43 PA...led Frisco in batting average, hits, triples, and at-bats (499)...also rankedamong club leaders in runs (2nd, 65), stolen bases (2nd, 20), doubles (3rd, 23) and RBI (3rd, 56)...hit safely in first 4 games at 8-18(.444)...batted .195 (16-82) in first 21 games through May 7...hit safely in 9 of next 10 games from May 8-18, batting .341 (14-41)during that stretch to raise average to .244...hit .288 (6-32) over 8 games from May 19-29 (G1), lowering average to .232...batted.349 (119-341) over final 80 games, from May 29 (G2)-end of season to finish the season at .315...started season-ending stretch byhitting safely in 19 of 20 games from May 29 (G2)-June 18 at .390 (32-82)...recorded season-high 12-game hit streak from June 7-18...also had an 8-game hit streak and hit safely in 7 consecutive games on 3 occasions...recorded 3 four-hit games and 3 or morehits in a game on 16 occasions...fell a triple short of the cycle on July 17 at Wichita, going 4-6 and establishing season-highs with 3RBI and 3 runs scored...also matched season-high with 3 RBI on September 3 vs. Midland...hit .308 (77-250) at home and .321 (80-249) on the road...batted .347 (34-98) from the leadoff spot of the batting order and .383 (44-115) when leading off an inning. Other Notes: Was named Rangers Minor League Player of the Month for July, batting .387 (43-111) with 8 doubles, 2 home runs and15 RBI during the month...also topped the .300 mark in June (.339) and August (.309)...registered a .952 (29 E/603 TC) fielding percentagein 118 games at shortstop...was 8-9 (.889) with 3 doubles and 3 RBI in 3 major league spring training contests...played forEstrellas in the Dominican Winter League...added to the Rangers' 40-man roster on November 18, 2005...in rankings by BaseballAmerica, was named best defensive infielder and as having the best infield arm among Rangers prospects. Acquired on March 23 as the player to be named later in the Alfonso Soriano/Alex Rodriguez trade with the New York Yankees of Feb. 16...ranked as Rangers' 3rd-best prospect by Baseball America after his first season at the High-A level withStockton...had the lowest ratio of strikeouts per plate appearance in the California League, one every 10.25 PA...ranked amongRangers organizational leaders in stolen bases (T2nd, 30) and average (8th, .300)...posted career-high 14-game hitting streak fromJuly 3-17 at .435 (27-62)...batted .550 (11-20) with 25 RBI with the bases loaded...collided with outfielder Vince Sinisi while chasinga pop fly on June 13 at San Jose...sustained a minor concussion on the play, missing most of 2 games before returning to the lineup,while Sinisi was sidelined for season with a broken left forearm...in rankings by Baseball America, was named best athlete, bestdefensive infielder, and best infield arm among Rangers prospects...also named by publication as 15th-best prospect in the CalLeague...first contest with Texas was spring training game on March 25, when he doubled in first at-bat for Frisco squad vs. SanAntonio...played 2 games for Estrellas in the Dominican Winter League. Spent entire season with Battle Creek of the Midwest League, leading squad in triples (8) while also ranking among club leaders in games (2nd, 130), hits (T2nd, 128), runs (4th, 60) andRBI (4th, 48)...led league's shortstops in total chances (632), assists (415) and double plays (78)...had 5th-lowest ratio of strikeoutsper plate appearance in the league, one every 11.82 PA...posted first career 4-hit game on April 15 vs. Quad City, a game whichincluded his first professional home run...had career-high 6 RBI on May 27 vs. Beloit...Battle Creek made playoffs and lost in semifinals. Made his professional debut with GCL Yankees after signing with New York-AL as a non-drafted free agent the previous summer...had the 6th-lowest ratio of strikeouts per plate appearance among all short season leagues at one every 13.63 PA, the 4th-lowest in the GCL...ranked T2nd in league with 6 triples...went 2-6 in DH on June 19 against Royals, first pro games. 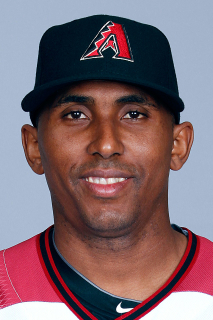 October 20, 2016 3B Joaquin Arias assigned to Leones del Escogido. 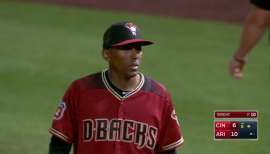 March 31, 2016 Arizona Diamondbacks released 3B Joaquin Arias. December 18, 2015 3B Joaquin Arias assigned to Reno Aces. December 11, 2015 Arizona Diamondbacks signed free agent 3B Joaquin Arias to a minor league contract and invited him to spring training. October 6, 2015 3B Joaquin Arias elected free agency. September 22, 2015 Sacramento River Cats activated 3B Joaquin Arias from the temporarily inactive list. August 25, 2015 Sacramento River Cats placed 3B Joaquin Arias on the temporarily inactive list. 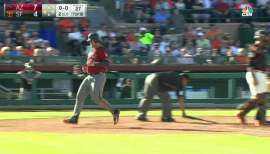 August 4, 2015 San Francisco Giants sent 3B Joaquin Arias outright to Sacramento River Cats. 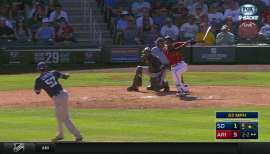 July 27, 2015 San Francisco Giants designated 3B Joaquin Arias for assignment. December 30, 2014 2B Joaquin Arias assigned to Aguilas Cibaenas. July 26, 2013 San Francisco Giants activated 3B Joaquin Arias from the 15-day disabled list. July 24, 2013 San Francisco Giants sent 3B Joaquin Arias on a rehab assignment to Fresno Grizzlies. 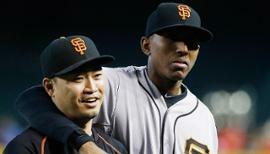 July 8, 2013 San Francisco Giants placed 3B Joaquin Arias on the 15-day disabled list. Appendicitis. November 25, 2012 SS Joaquin Arias assigned to Aguilas Cibaenas. April 25, 2012 San Francisco Giants selected the contract of 3B Joaquin Arias from Fresno Grizzlies. April 5, 2012 Joaquin Arias assigned to Fresno Grizzlies. January 18, 2012 Joaquin Arias assigned to San Francisco Giants. December 11, 2011 San Francisco Giants signed free agent 2B Joaquin Arias to a minor league contract and invited him to spring training. November 2, 2011 2B Joaquin Arias elected free agency. October 14, 2011 2B Joaquin Arias assigned to Aguilas Cibaenas. May 9, 2011 2B Joaquin Arias assigned to Omaha Storm Chasers. January 3, 2011 Kansas City Royals invited non-roster 2B Joaquin Arias to spring training. December 22, 2010 Kansas City Royals sent 2B Joaquin Arias outright to Omaha Royals. December 19, 2010 Kansas City Royals designated Joaquin Arias for assignment. November 4, 2010 Kansas City Royals claimed 2B Joaquin Arias off waivers from New York Mets. October 22, 2010 SS Joaquin Arias assigned to Leones del Escogido. September 1, 2010 Joaquin Arias assigned to New York Mets. August 31, 2010 New York Mets traded RF Jeff Francoeur to Texas Rangers for Joaquin Arias. August 24, 2010 Texas Rangers designated Joaquin Arias for assignment. August 16, 2010 Texas Rangers activated 2B Joaquin Arias from the 15-day disabled list. August 11, 2010 sent SS Joaquin Arias on a rehab assignment to Frisco RoughRiders. July 31, 2010 Texas Rangers placed 2B Joaquin Arias on the 15-day disabled list. Strained back muscle. May 16, 2010 Texas Rangers activated 2B Joaquin Arias from the 15-day disabled list. May 8, 2010 sent SS Joaquin Arias on a rehab assignment to Frisco RoughRiders. April 30, 2010 Texas Rangers placed 2B Joaquin Arias on the 15-day disabled list. lower back strain. February 1, 2010 SS Joaquin Arias assigned to Dominican Republic. October 19, 2009 Texas Rangers activated 2B Joaquin Arias. October 16, 2009 SS Joaquin Arias assigned to Leones del Escogido. August 5, 2009 Texas Rangers optioned Joaquin Arias to Oklahoma City RedHawks. July 29, 2009 Texas Rangers recalled Joaquin Arias from Oklahoma City RedHawks. May 12, 2009 Texas Rangers optioned Joaquin Arias to Oklahoma City RedHawks. May 9, 2009 Texas Rangers recalled Joaquin Arias from Oklahoma City RedHawks.